New tools are expensive and you may not really need that many. See the list below for the basic items which most people need, but otherwise try buying things only when you find you really need them. If you can, lay your hands on a set of good second-hand tools that have been properly looked after. Alternatively you may find individual items on eBay or in secondhand shops. For good quality new tools, look at the range offered by Abbey England and Tandy. Nearly everything I use can be seen in the pictures at the top of this page, though some of these are unnecessary duplicates. Not illustrated here are: vital supplies such as the leather itself; brass rings, slides, clips, studs and buckles; braided cotton webbing; sandpaper and contact adhesive; dyes, leather treatments and polishes; work-top tools such as a large right-angle 'square', a polished granite block and lead block (for stamping and punching work) and electric buffing wheels. Everyone works and organises their tools in their own way. For me  given the sorts of things I make  I divide my tools into five broad groups (cutting, preparing, punching/stamping, stitching, finishing) which are kept separately in waterproof boxes. I like having just one box beside me when I'm cutting out and preparing the project and another self-contained set when, for example, I'm stitching. Inevitably a few tools, such as scratch awls and small rulers are therefore duplicates. Cutting boards are very important throughout a project. I use nylon kitchen chopping boards, available cheaply in most supermarkets. Knives & blades (see pictures at top of page and left): I have a Clicker's knife (invaluable), a general purpose Straight knife, a shaped French knife; a straight angled Skiving knife and a curved Opinel knife for stitching. I also have a traditional English Round knife which I tend to avoid as it's viciously dangerous if you handle it wrongly. I also have a number of surgical scalpels. I have three hammers (see pictures at top of page and left): a heavy iron mallet for stamping work (using leather offcuts to protect the tool heads), a small tack hammer and an all-purpose dual-headed polyurethane hammer. There is a wide range of available Punches & stamping tools (see pictures at top of page and left), but what one needs depends on the work envisaged. Some, like strap-end punches, wad punches, crew punches and button-hole punches can be very expensive. Simple hole punches are cheaper. A simple belt, for example, will need an oblong punched slot (perhaps 1") for the buckle tongue to pass through, as well as normal belt holes (a No. 5 perhaps) and perhaps a shaped end (such as a 1" English point). If you have to buy these (new or second-hand) they should, however, last a lifetime if used properly. The tools and supplies for Stitching (see pictures at top of page and left) are generally much cheaper. I use black or brown Ritza/Tiger polyester waxed braided thread (1mm thick in spools of 500 metres) and standard blunt-ended harness needles for almost all my projects. While stitching I keep beside me a Scratch awl, a small pair of curved pliers (to tackle awkward needles) and a sharp, curved-blade Opinel knife. Most importantly I prepare my stitching holes in advance using diamond-pointed Japanese pricking irons and use an indispensable smooth-ended diamond-shaped stitching awl to finish hole preparation. Also in my stitching box is a small ruler, a small lump of beeswax and a bone 'folder' for settling and smoothing finished stitching. I'm not an expert on leather because until now, almost without exception, I've used recycled English, Italian, Belgian and French leathers. My advice is to research the whole subject in detail and then use the best leather you can find and can afford, taking advice from good local suppliers. All leather is expensive and I use full-grain, vegetable-tanned hides (as used in the best quality English harnesses and saddlery), but these are some of the most expensive of all. Among softer leathers, Italian hides are superb. I have been very unimpressed by some soft Argentine leather as sold in well-known craft shops. It has little strength or resilience and is generally 'soggy', quickly losing its shape. In Britain, Abbey England or Tandy can advise on what hides would suit your project and which part of the hide would best suit your needs. My experience is that a finished project never looks any better than the quality of the materials, tools and skills put into it. I find it easiest to stand while doing most of my cutting and preparation. For this reason I have a high, very solid timber work surface (91 cm from the floor), covered with a clean old blanket. I also have several very bright lights (from different angles) so that I can see and work very precisely. The work surface needed for most leatherwork can be surprisingly small. Mine is 100cm x 60cm and more than big enough for my needs and all my tools in racks at the back. Part of this surface is taken up by a Dremel 4000 rotary tool (mounted on a Dremel drill press) which saves a lot of time in finishing edges, polishing brass fittings and keeping tools sharp. Until leather has been treated and polished it's extremely sensitive to cuts, scratches and stains (just like human skin). This is especially so when leather is damp  which it needs to be when you want it to take up a particular form or you need it to receive your maker's stamp. The blanket greatly reduces the risk of damage. In fact, leather is so vulnerable to nicks and blemishes that I keep my finger-nails well trimmed and never leave anything metallic or sharp on the work surface. I also do any messy and risky work (dyeing/staining, stamping, punching, fat treating, wax polishing, etc) on a separate work surface. Stitching needs a minimal work surface and can be done seated almost anywhere around the house provided there is plenty of light. Outside in daylight is best for me and when I have a long run of saddle stitching to do, I use a yew-wood stitching clamp made for me by a friend. The jaws of the clamp hold two pieces of work together, leaving me two hands free to work the awl and needles. The first items I made were sometimes dreadful. This was because I had no idea at the time how important it was to plan ahead and think the project through. When you've made your third turkey, you too will agree that spending a few minutes cutting out cardboard shapes is time well spent. Plan the project very, very precisely (measuring to the nearest millimetre) and then think through how and in which order each piece will be sewn to the next, bearing in mind that some may need to be fitted out with straps, buckles, rings, slots, etc., before they're stitched to others. There will be a logically correct assembly order and it's best to have all the components ready and finished before they're put together. It is at this stage that you'll have to remember to skive this piece, punch holes in that piece and run an edging tool around a third piece, because it may be too late to do these things if you've already stitched them up and (as it were) painted yourself into a corner. If you get the chance to take apart an old dog-collar, a sad handbag or a disintegrating knife scabbard, you'll soon work out how the original makers must have prepared their work. Common sense will show you how they pre-assembled the various components and finally stitched them together. The fun bit is finding a more elegant solution of your own. There are just two simple rules to cutting: use the right knife for the right job and be sure that the blades are always razor sharp. Unless your blades are at their sharpest, the results will be poor and the knives themselves will become dangerous. I have four specialist knives that I use on almost every job. The first is a 'clicker's knife' which has a short, curved blade like a hawk's beak. This is used for cutting out lengths or shapes of leather in straight or curved lines from the original hide. Next I have an exotic 'French knife' which can sometimes replace the 'Clicker's knife' but which is cleverly designed to be useful for cutting, shaping and skiving in all sorts of situations. This is the French equivalent of the English 'Round knife' and I find it easier to use. The third is an angled 'Skiving knife'. Skiving (thinning down the edge of a piece of leather or tapering the end of a belt or strap) can be done with many specialist tools and you need to use whatever feels safest and suits you best. For me, the angled Skiving knife works well but only if the blade is truly razor sharp and finely polished. The fourth knife is quite simply a 'Straight knife'  a fairly standard, all-purpose knife for trimming edges, corners, strap-ends, etc. Knocking around on my work surface are two or three other pocket knives too: a curved Opinel pruners' knives for stitching and a small straight-bladed Opinel knife for general workshop needs. Keeping all these blades in good condition is easier if you have a steel file (flat, fine-grade) for re-angling or re-shaping a damaged blade; a carborundum stone (good quality, fine-grade + oil); a high-speed rotary buffing/polishing wheel (e.g. 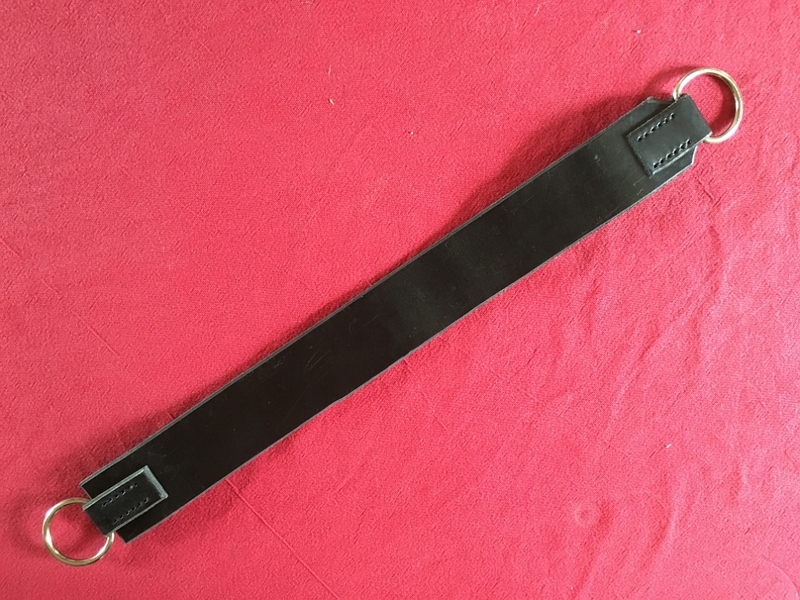 Dremel); and a leather strop (like this) that you can make yourself to hone your blades before starting a new task. The art of saddle stitching (e.g. using two harness needles, one at each end of a length of thread) is not complicated but it involves a technique that needs to be mastered all the same. I learnt a great deal from the excellent YouTube films made by Ian Atkinson of Leodis Leather... [thank you, Ian!]. The only thing I would add to his advice is NEVER to skimp on thread. There's nothing more infuriating than to come almost to end of a row of stitching and then find that you haven't got quite enough. Thread is by far the cheapest material in your project, so use at least as much as you need. The other rule is to prepare your work as precisely as you possibly can. As I said above, leather is extremely strong and resilient, but it's also very delicate and supple. If you count your stitches wrongly the leather will happily stretch to accommodate your error. But beware, because when you see your finished piece, just one stitch too many (or too few) can skew the whole finished article out of true. A small slim horizontal iPhone 6S case, square corners, black recycled saddle leather with dark brown strap, all stitched. For Nađa Kafedžić. A case for valuables made from recycled Italian leather (in a waterproof Pelicase) with side slots for a Brompton cycle repair kit and cycle lamp, with Sam Brown stud and two brass D-rings. For me. A slim case made from recycled Italian leather for an iPhone 8 Plus with Sam Brown stud and two three-bar drop slides. For SRL. A slim case in soft Italian leather for an iPhone 8 Plus, with brass Sam Brown stud and three-bar drop slide remodelled with a new strap closure, a second three-drop slide and a green baize lining (see No. 72). For me. An old 1950s music case restored. It was falling to pieces, the stitching decayed and the leather as dry as cardboard. It was taken apart and entirely restiched by hand, the leather being deep-treated with wax and oils. Repaired for Sandra Hollis. A large spectacle case hand-stitched from soft Argentine leather with a reinforced spine. For Mary Ann Furze. A passport size wallet hand-stitched from French leather. Suitable for adapting to a phone case. In stock. A spectacles case hand-stitched from recycled Italian leather with a reinforcing spine. For me. 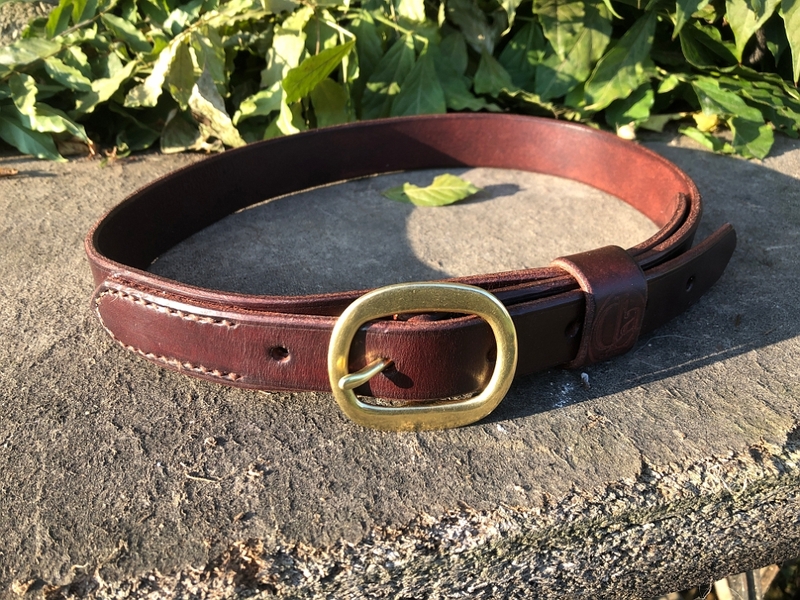 A heavy duty yeoman's belt with extra-large 1.5 inch brass buckle with stainless steel tongue and a small D-ring, hand-stitched from recycled Belgian leather. For me. A passport size leather wallet hand-stitched from French leather and designed to take an iPhone 8 Plus. For me. 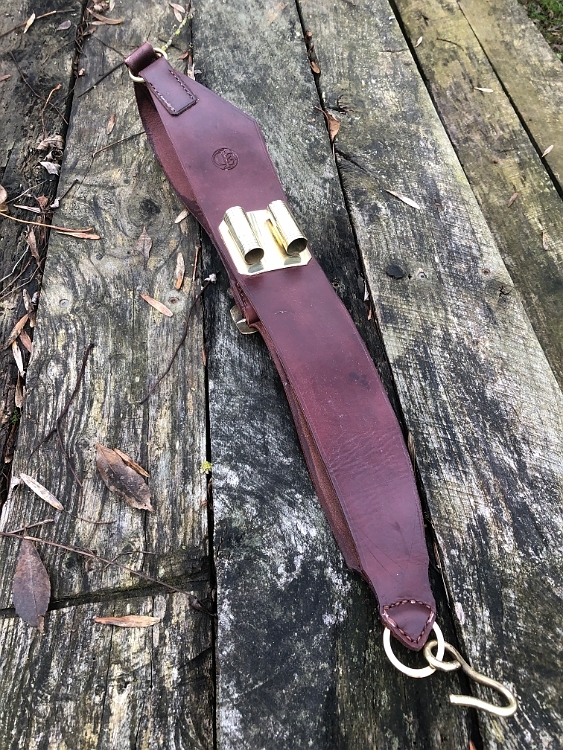 A leather and heavy duty elastic stable belt with 1.5 inch fireman's quick release brass buckle with, hand-stitched from recycled Italian leather. For me. A leather and heavy duty elastic stable belt with extra-large 1.5 inch brass buckle with stainless steel tongue, hand-stitched from recycled Italian leather. For me. A pair of side reins for dressage training, hand-stitched from Belgian strap leather with nickel-plated buckles and heavy-duty elastic shock-absorbing bridle tails. For Melissa Alexander. A leather belt, dark brown English belt leather, hand-stitched with solid brass buckle. For Blanche Robiaille. New leather strap-work for a town-cryer's drum, hand-stitched from recycled Italian leather using the original brass, ring, buckle and stick holders. For Matthieu Riondet. 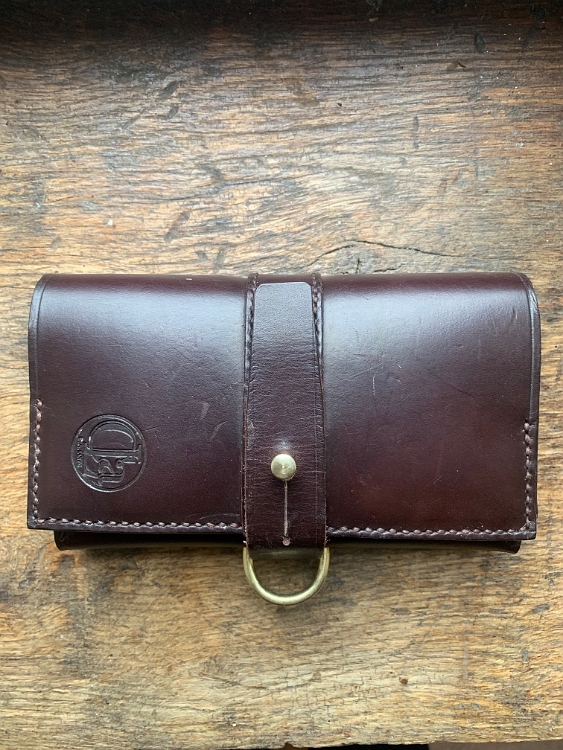 A three-fold iPhone and passport wallet, hand-stitched from French leather with a solid brass D-ring and Sam Brown stud. For me. eather has always appealed to me  the smell, the texture, the stange combination of suppleness and strength  but it wasn't until March this year  that I ever considered that I might make things from it myself. In fact the idea only came about when a friend unintentionally smashed my iPhone and I knew that my new one would need the protection of a well-designed leather case. But nowhere on the web could I find exactly what I wanted. The same problem arose when I was looking for a little leather bag to hold a puncture repair kit for my Brompton bike. When I was a child, men riding their bikes to work often had one of their fathers' World War l leather ammunition pouches attached to the back of their saddles (see photo right). The 'real thing' was the traditional little bag made by Brooks. 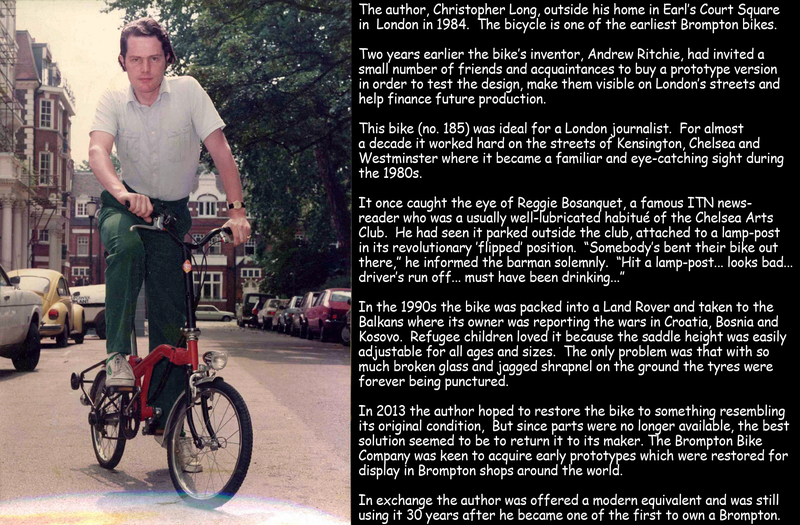 But today a new Brooks bag can cost almost as much as a second-hand bike. Right: Genuine WWl British military ammunition pouches. In the 1950s these were often re-used as bicycle saddle-bags for tools and puncture repair kits. This pair inspired the author to try leatherwork himself. 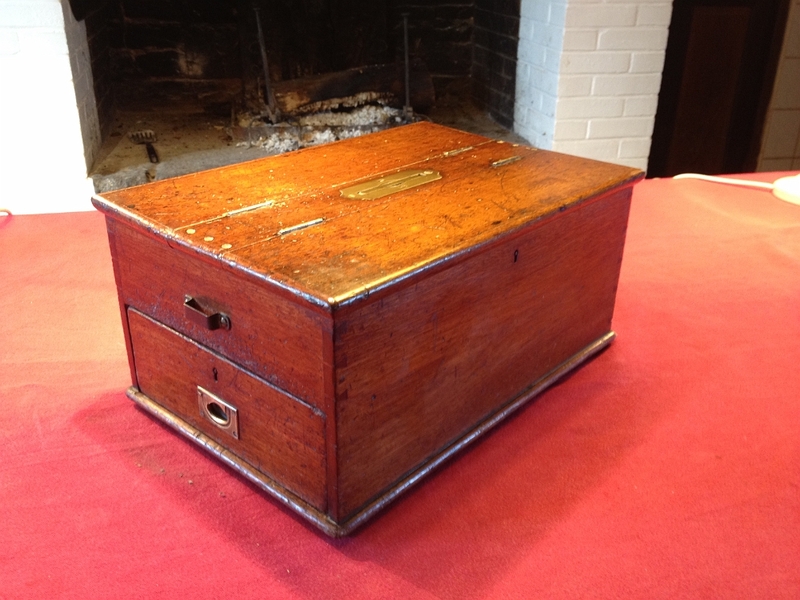 Below right: John Hogbin's Victorian mahogany leatherworker's box, bought by CAL in 1974 complete with tools. And so I wondered if I could make something that would do. And by an extraordinary coincidence I remembered that somewhere I had a box of exotic-looking Victorian tools which had been languishing in the dark in a succession of attics for the past forty years... Were these by any chance leather-working tools? Well, they were. And so I started watching many of the excellent YouTube films by Ian Atkinson of Leodis Leather. He taught me a lot and then I was lucky to get encouragement from two local master saddlers, Chris Garrett and André Bubear. As I collected a few more tools, friends offered me several large, thick, vegetable-tanned hides which had become suitably 'distressed' after spending years on an office floor pretending to be linoleum. Carefully (the best word would be 'gingerly') I began making things for myself and of course I made terrible mistakes. But I was surprised to find that I could plan out the job, cut and shape the leather, attach buckles, straps and rings and then sew the thing together by hand. These six pictures (right) show most of the tools I use for all my projects. © (2017) Christopher A. Long. Copyright, Syndication & All Rights Reserved Worldwide.